When you arrive at the entrance of the Four Seasons Los Angeles at Beverly Hills, you feel like you have arrived; the surroundings dictate your absolute best, in the same way that working with a great leader or sharing a space with a superior athlete pulls the best out of you. Located at the heart of Doheny Drive and Wilshire Boulevard in the middle of the city, it’s like a vortex that draws you away from the common everyday experience of a city and into the Four Seasons brand experience. The aim of the Four Seasons is to deliver an exceptional, world-class interaction to its guests in each of its many forms and functions. From the way you are greeted by the bellhops at the front door, to the high-priced paper stock of stationary bearing its signature name at the front desk, everything is top end. Each staff member that I encountered carried themselves with warmth; whether the staff behind the front desk or maintenance crew personnel at the pool, everyone is trained to ask you how you are and if there is anything they can do for you. Not with the frivolity of a greeter at Wal-Mart, but with a legitimate sense of concern born of the common goal of creating the utmost in quality. Even the sound your dress shoes make when traversing the open marble floor of the lobby has a feel that separates it from a normal experience. The view from my room was the absolute stereotype of luxury that exceeded even what I anticipated in my imagination prior to arrival. 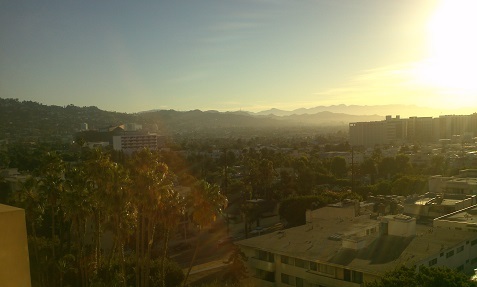 I stepped out onto the balcony and to my left were the rolling Hollywood Hills, compete with a view of the famed “Hollywood” sign which was a mere 12 blocks away. Directly ahead was a view of downtown LA and to the right off in the distance was a view of the Pacific Ocean. When you experience this view and the accompanying openness, you feel like you can create anything; the paths are open and your experiences are only limited by your will. It doesn’t take long to see why the “Who’s Who” of high society frequents the Four Seasons, especially when you spend time in the workout facility. While physical exertion in a confined space has long been associated with concrete floors, antiquated equipment and the old adage, “No pain, no gain”, the Four Seasons brand quality also extends to the gym. Surrounded on all sides by open windows and external foliage, the dense natural lighting and aroma carried in by the breeze, the weight room would be superior to most hotels’ lounge area. It’s easily the most tranquil environment I’ve ever worked out in. The open air theme is prevalent throughout, culminating in an open concourse from workout room to outside pool setting. The pool is located on the fourth floor, which means you can “chillax” with nothing but open sky above you and the cityscape at your feet. The pool setting is the perfect metaphor; you’re above the commonality of average experience and anything you want is at arm’s length. 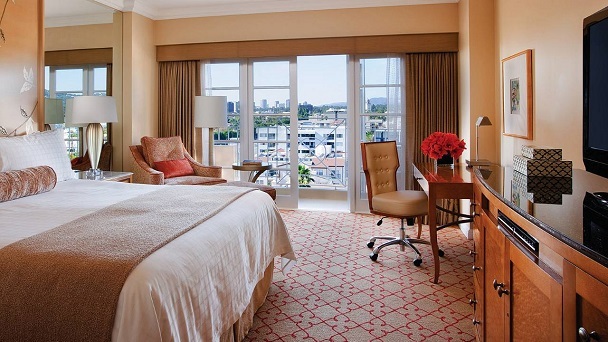 Once you get to the Four Seasons in Beverly Hills, you won’t ever want to leave. And that’s why you’re willing to pay a premium to be in their company. The Four Seasons is the absolute best hotel in the world.